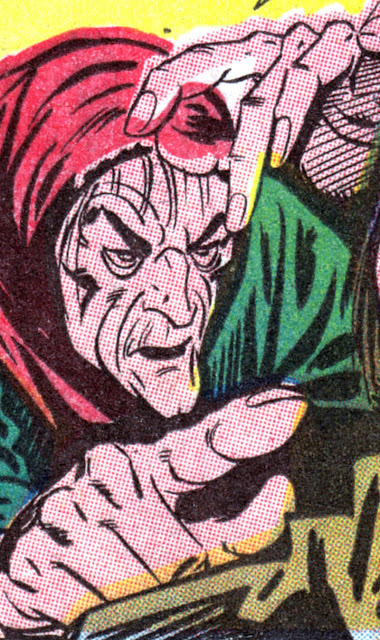 Joe Gill writes and Steve Ditko draws the 7-page story "Don't Lose Your Head" in MANY GHOSTS OF DOCTOR GRAVES #43 . Starting during the French Revolution, where the conniving servant of an innocent doctor uses the chaos to have his master beheaded, so he can make off with his master's wealth. Unfortunately for him, he gets a curse placed on his family to suffer the same fate as his master, and we follow the generations of his family losing their heads in various ways up to the then-recent year of 1972. Fairly straightforward story, with a bit of an abrupt ending, the various settings in time and variety of deaths play well to Ditko's strengths, and there are a lot of great faces.